When it comes to issues surrounding the replacement of American hose and hydraulic safety for your industrial equipment, the sooner you can get the parts you need, the better. You count on your hydraulic system to get the job done every day, so it pays to stay on top of hydraulic hose services to prevent downtime or costly failures. You should strive to make sure that everything is working as it should and take time to replace worn hoses at your local industrial supply and services center. Metro Industrial & Marine Supply carries a wide variety of hoses, fittings, and hydraulic hose clamps to best serve our customers. Getting the right fittings for your hydraulic hoses is extremely important to the successful operation of your equipment. While a lot of focus is put on the type of material and rating of the hose itself, and rightly so, the fittings are also very key to the quality of your hydraulics operations. Without the right parts and components, your hydraulic hose system will not work properly. Getting the right fittings and hydraulic hose clamps from industrial supply and services is an essential part of ensuring that you have the right American hose and hydraulic safety. It protects not just your equipment, but the operator of the machine, other employees, and anyone else in the vicinity of the equipment. Proper hydraulic fittings, purchased through custom hydraulic hose services, help to maintain the strength of the hose itself. Getting the right type of hydraulic hose is one thing, working to facilitate high amounts of pressure for your machinery. However, you also need the proper fittings at all of the connection points or the whole thing will fail. Any type of weak spot is where the system will break down, so everything from the type of hose to the fittings used to connect it, as well as any seams, angles, joints, and hydraulic hose clamps used, must be designed for the work that it needs to do. Getting the proper fittings for your hydraulic hose at our industrial supply and services also works to prevent leaks. Due to the increased strength and abilities of today’s advanced hydraulic hoses, the most common place that you will find a leak of hydraulic fluid is near the seals that are made between the hoses and the fittings. So if the fitting is not designed to work with the type of hose that you are using, it won’t provide a strong seal, and you will eventually experience a leak. Custom hydraulic hose services are essential for most industries because the truth is that there is no one-size-fits-all solution for American hose and hydraulic safety. 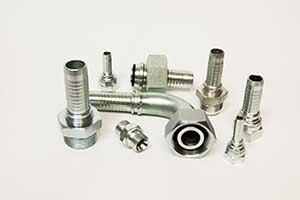 The hoses, fittings, and other hydraulic components are not universal – they do not all just connect perfectly like a child’s building blocks. You can’t just use a fitting that appears to fit; you need to know which one is designed to work with the precise hose that you have to ensure a tight seal and prevent leaks. Mixing Asian or European fittings with American hose will almost always be a misalignment, creating an unreliable connection. At Metro Industrial & Marine Supply, we employ a team of highly trained and experienced technicians who have the knowledge necessary to create top quality custom hydraulic hose assemblies according to your needs and specifications. We work with many different industries, not just in the Southeastern Massachusetts area, but all across the country and even fulfill orders around the globe. If you need help with custom hydraulic hose services, you can count on our team of experienced technicians to produce quality hydraulic hose assemblies with same-day or while-you-wait service. Businesses in Fall River, New Bedford, Boston, Providence, and the surrounding Southcoast region come to Metro Industrial & Marine Supply because we offer a unique service. There aren’t many hydraulic hose services available in the Southern New England area that can create custom orders with same-day service. When a hydraulic hose assembly fails, you need to get it back up and running as quickly as possible to prevent downtime. Our goal is to offer services to our customers that will meet or exceed their expectations. If you are interested in learning more about our services or would like to place an order for hydraulic hose assemblies, hydraulic hose clamps or other components, just give us a call at 508-996-8400.